It seems that the woman who denied war vets access to their Memorial is the same one who will get to deny them their health care. But don’t worry the mainstream media reminds us Sylvia has a smiling face. Health and Human Services director Kathleen Sebelius replacement Sylvia Mathews Burwell, handpicked by Barack Obama on March 4, 2013 as new director of the Office Management and Budget, is coming to the HHS portfolio under a stench. It’s not just the usual stench wafting from epic fail ObamaCare, nor even the stench from sorting through the garbage looking for clues on lawyer Vince Foster’s demise back in the days when she was working for the Clintons. 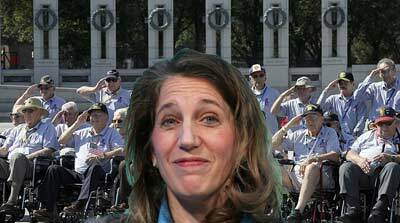 It’s the permanent stink that no soap or perfume will ever mask: the denial of access to war vets to visit their own war memorial in Washington, D.C., which originated with Smiling Sylvia Burwell. On the job as director of the Office Management and Budget only six months, it was Burwell’s email that “initiated the process that closed national parks—like the National Mall containing the War Vets Memorial—visitors’ centers and even the “panda-cam” at the National Zoo. For this dubious distinction in Obama regime history, ‘Barrier Burwell’ is still being lauded as “the single person who shut down the entire U.S. government for the first time in 17 years”. Sounds like Sylvia and ObamaCare will be perfect together. Obama taps woman? Funny. I always thought he was gay. Maybe he's bi. Then again I've always wondered if Malia and Sasha arrived courtesy of a turkey baster.